Kroger has made effective deals, including a recent partnership with MSFT. But its identity crisis is hurting KR stock. When Amazon.com (NASDAQ:AMZN) announced in 2017 that it would pay $13.7 billion to buy Whole Foods, my reaction was that, for another $10 billion, AMZN could have bought all the shares of Kroger (NYSE:KR) stock. Kroger, at that time, held about 10% of the U.S. grocery market, against less than 2% for Whole Foods. The big dog on that street was Walmart (NYSE:WMT), which had a 26% share of the sector. The market cap of KR stock this morning was $22.73 billion, barely one-sixth its fiscal 2018 sales. The market cap of Walmart stock, on the other hand, is equal to more than half of the company’s sales. But the whole story of KR stock is a little more complicated. A grocery store isn’t just where food is sold. It’s also a place to which food is supplied. The key to winning isn’t just getting people to come in and buy the merchandise. Supplying stores at the lowest possible prices and keeping inventory losses to a minimum are also key parts of the business. Kroger has made a number of deals to boost its performance in those areas. It has become the U.S. licensee for Ocado, a British company that aims to make profitable online sales through automated warehouses. It also bought Home Chef, a meal-kit company. Warehouses like those designed by Ocado can break bulk efficiently and centrally. Meal kits like those of Home Chef reduce waste by sending people only what they need to cook a meal. Not all the competition in this space is taking place on the sales floor. The real problem for Kroger and owners of KR stock remains that no one knows what Kroger is. As I have written many times, Kroger is Mariano’s in Chicago. It’s Harris Teeter in North Carolina, and Ralph’s in California. It’s King Soopers in Colorado and Fred Meyer in Oregon. All these retail chains operate independently, as we learned when Kroger closed its Kroger-branded operations in North Carolina, whose workers were unionized, and replaced them with Harris Teeter stores, whose employees are not in unions. KR has the same problem that Federated Department Stores faced in the last century. Federated finally chose Macy’s (NYSE:M) as its brand, and as recently as 2015, Macy’s was doing well, until the performance of shopping malls tumbled. 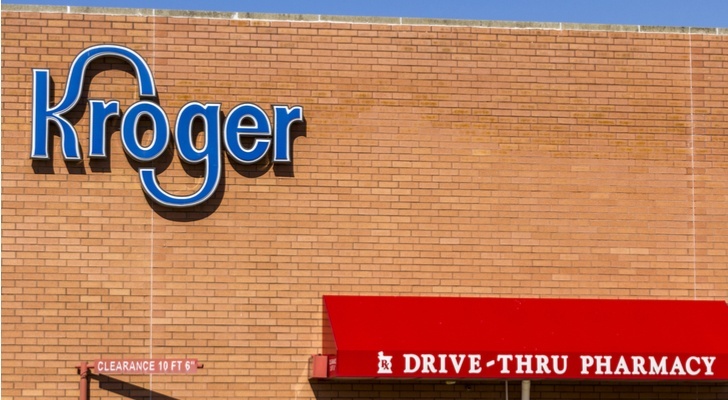 Kroger might do well to remember this history and consolidate itself under one brand name, rather than doing side deals like selling its convenience stores, which it did last year for $2.15 billion. If Kroger had a single identity, its deals with MSFT, Ocado and Home Chef would have had much more of an impact on KR stock. But that’s one big change that looks unlikely to happen, which is why KR stock is selling for 31% less than it did in late 2015, against a 26% gain by the S&P 500. KR stock has held up well in the current volatile market, and it’s risen over the last six months. But KR stock is still a defensive play, appealing primarily to risk-off investors. That is sad because KR stock could be so much more. Article printed from InvestorPlace Media, https://investorplace.com/2019/01/kroger-stock-could-be-so-much-more/.